while wading through shin-deep floodwaters in bgy. de la paz in biñan, laguna, a young man clutching onto some donations paused to speak to a young woman who had just purchased some canned goods from a make-shift store. the man complained that the woman has not given him any animals; she replied that she'd sent over a banana tree, an elephant, and a cow, and that all these gifts would be received if he also sends over something. the man promised to send over a plant. the two were talking about farmville, a game application in facebook. there is no visible plot of land within their 10 minute radius where they could possibly plant anything that cannot grow on a pot, as the rising level of the laguna lake has turned surrounding villages into virtual water worlds. seven days after ondoy poured a month's worth of rain in less than 6 hours over metro manila and its surrounding provinces, communities are still submerged in flood, and families continue to live on the second level of their homes, and get around on anything that floats: canoes with a single outrigger, giant inner tubes tied together, watertight drums festooned under wooden planks, the carcasses of old refrigerators, and bunched up styrofoam. the fact that the two were talking about facebook does point to a filipino fascination with online social networking sites. but the fact that they were talking about it in the midst of misery and devastation points to another quality of filipinos which i cannot quite put a finger on. others may call it resilience. some may refer to it as happiness. i wonder whether it is something under the category of surrender and resignation. on friday night, several members and trainees from the AMCI mountaineering club, inc. gathered at the residence of mannie dela serna to repack water bottles, rice, canned goods, noodles, used and new clothing, into approximately 250 bags of relief goods. there was a discussion whether the deployment would take place the following day, when typhoon pepeng (parma) was scheduled to make landfall. eventually, it was decided that saturday would be the day to distribute whatever we have collected. more than the number of expected volunteers showed up: there was nothing for any of us to gain from the endeavor, but many were willing to allocate a portion of their time for the efforts. earlier in the week, some 300 bags were already handed out in san mateo, where flash floods ravaged communities and leveled entire homes. 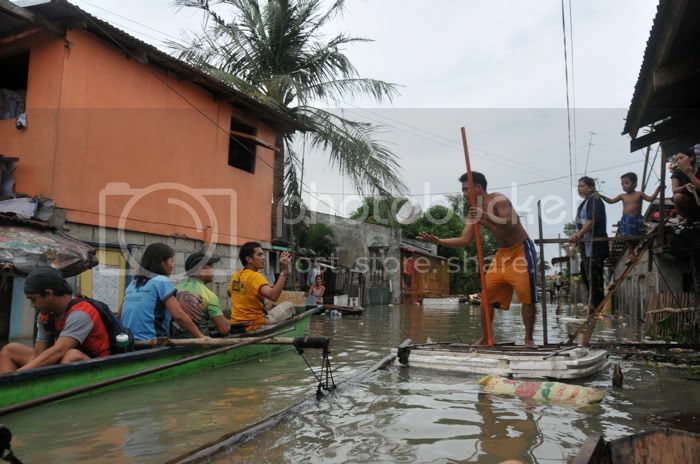 laguna was chosen on the basis of reports that many villages remain submerged in floodwaters from laguna lake. 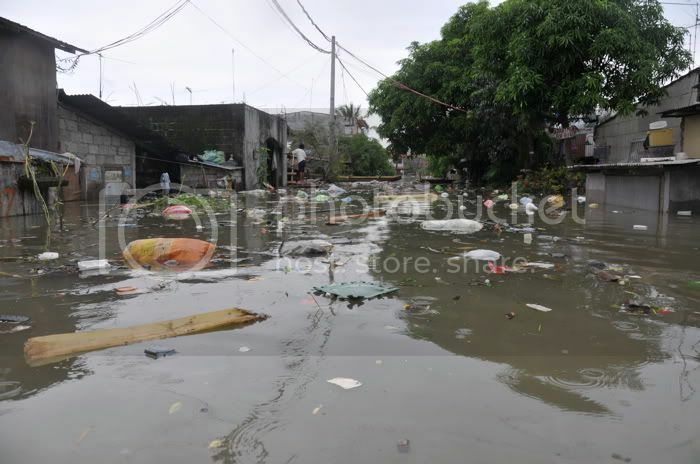 karl called up some contacts in biñan, and shortly after lunch on saturday, we were entering narrow passageways that had visibly been affected by the flood. when we reached de la paz, tricycles and makeshift flotation apparatuses gathered at the fringes of a muddy street where dry land and flooded by-ways met. 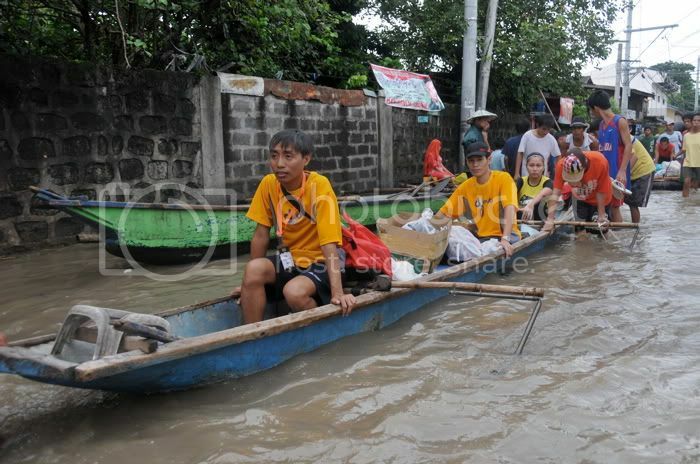 we immediately planned on going to yatco, at the far-end of the barangay, which is still under 6 feet of water. while we transfered our bags onto tricycles, a woman inside a van asked if we could facilitate the distribution of the relief goods they collected. instantly, our stock increased by another 250. she said that she would rather have outsiders take care of whatever they collected, than entrust the distribution to local officials. apparently, she has also read about barangay officials opening sari-sari stores at times of similar calamities. and shortly after, another two cars handed us their goods: an additional 100 bags. they didn't bother asking which outfit we were from; it was sufficient for them to see that we were outsiders willing to help, and also willing to brave murky waters to reach out to those most in need. at the time, locals had already milled around us, and we were half-concerned that we might fall victim to an angry mob. we routinely plucked burly men from the streets to act as our bodyguards, and secure our relief goods, and ensure the safety of the volunteers. initially, i forded through the murky floodwaters, confident that my gaiters would keep me more or less shielded from whatever diseases that may be floating on the water. visibly, commerce goes on: the boats aren't there as some form of assistance. they've taken the place of tricycles and jeepneys which are obviously not amphibious. 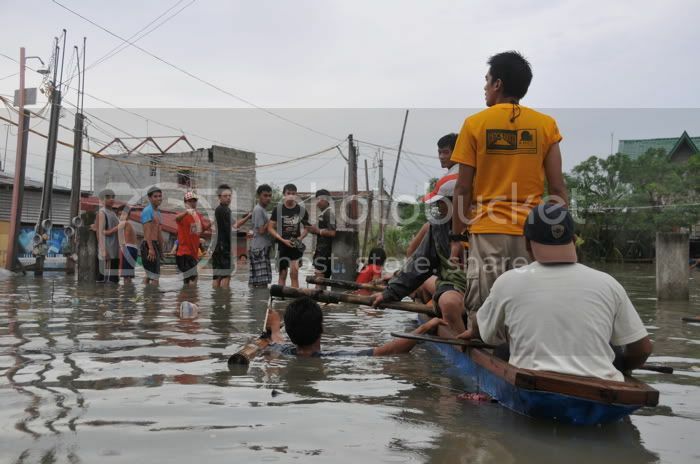 the boatmen, who may either use paddles fashioned from wood and the cover of a can or alternately push and pull the canoe, are also businessmen, trying to eke out a living from the disaster. some families have already decided to evacuate: furniture and appliances are being shipped out, but there are many who still insist on staying. at the beginning of the trip to yatco, several women already inquired if we were giving out tickets, or if we were going to visit their areas. a few of them tried to convince me that they were affected worse than others. after a few minutes, we found yatco, or at least, what remains of it, 5 feet upwards, floating in trash, debris, and a mix of gratitude and greed. the water in some parts reeked of a foul odor. i began to think about sanitation and the spread of disease. maybe we should have been handing out antibiotics as well. from our little canoes, bags were handed out to families peering out of second-floor windows and sitting useless on their roofs. many of them were profuse with thanks. others were adamant and insistent that we give them more, and do not seem to have gratitude in their vocabularies. some women overly dramatized their plight, saying that they had nothing to eat, when they were surrounded by fully-stocked stores that still functioned despite the flood. i gathered from one man that the area gets flooded every 6 years, but this one was the worst since 1988, when the waters drained only in january the following year. this makes you wonder why people insist on staying, when lives are are completely altered by the rising tide. but then again, when the coming of a flood becomes a cycle, a routine, you tend to wonder whether they have an entirely different concept of normal. 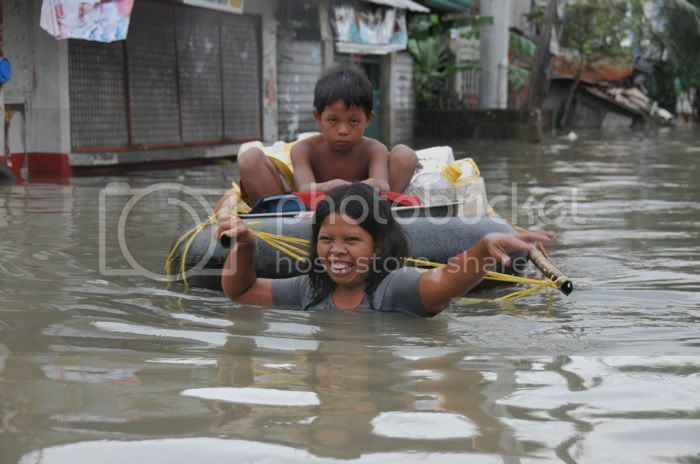 so people say that filipinos tend to cope with disaster in a manner that is characterized by hopeful cheer and unparalleled optimism. i wonder whether that is a quality that is unique to our culture, or whether it is because we are so used to misery, whether wrought by natural calamities or induced by human neglect, that we are so accepting of the temporary disruption of our lives. perhaps it is because we have seen worse, or expect to see much worse, that we are able to laugh at, and laugh despite, the most dire of circumstances. is it because a high quality of life and a functioning government are things which lay beyond our normal expectations, that we are always ready to deal with situations of emergency? these are questions we need to ask ourselves, and this might pave the way for a better tomorrow for all of us, devastation and disasters notwithstanding. after handing out all our bags, we silently moved out of yatco amidst cheerful goodbyes and thankful waves from individuals who said that we were the first to reach out to them, despite the hisses and whispers that we were selective in giving out help. certainly, not one person has a monopoly on misery, and we were not qualified to make a determination of who appeared to be more needing than others. we did what we could given our limited resources, out of a pure desire to help: we did not desire fame, and doubt very much whether we would gain any from our actions. 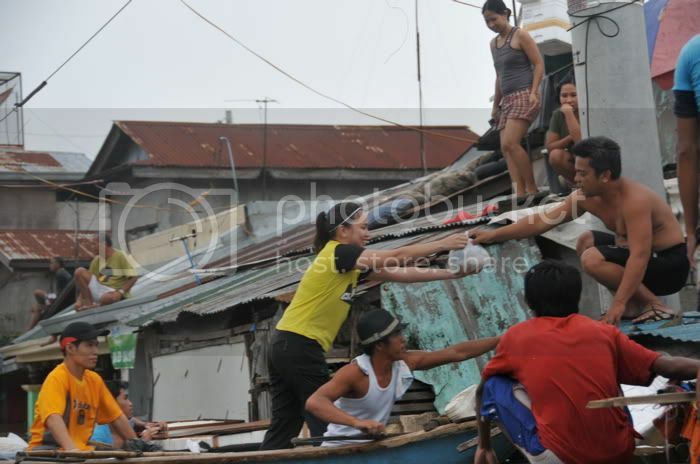 it was sufficient for us to see genuine gratitude and sincere smiles in the midst of tragedy. we are among the lucky ones, virtually unaffected save for a number of inconveniences which pale in comparison to those still living in the squalor of the flood. and everyone fortunate enough to have been spared should celebrate by donating a portion of his or her time, wealth, and prayers to rebuild the lives of our beloved countrymen, and birth the future of our beloved country.